My next two shawls are on the hook and needle. 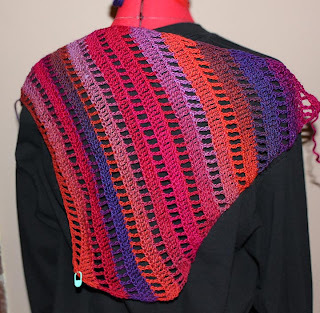 This one - is knit with my handspun from Kay's Tess D'Urbervilles Shawl pattern. It's garter stitch with increases on the sides and in the center. Very basic, but very warm shawl, with just a touch of glitz and sparkle in the yarn. Even though I'm not even half done with the knit shawl, I had to have something on the hook; it makes me antsy not to have a crochet project ready and waiting. 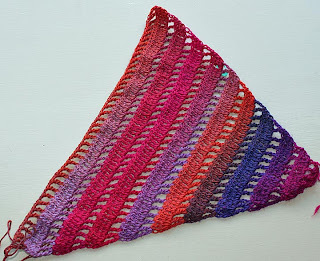 This one - is Clapochet, a crochet version of the knit Clapotis, made with Mini Mochi, a sock-weight yarn. 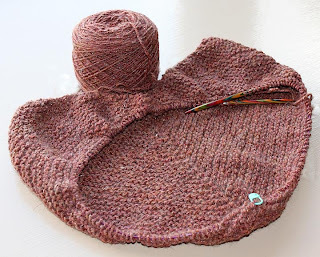 I'm making this bigger than the original pattern, going for shawl-sized, rather than scarf-sized. I'm one skein into this and have two more waiting in the stash, but I may have to buy an additional skein to get this as big as I want. It still counts as stash busting though. These are beautiful. Congratulations to you. Wish I could start a yearly project like this. So maybe you have influened me to do so.